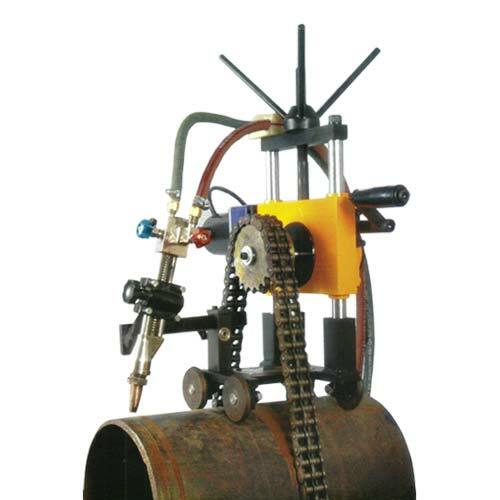 Portable Gas Pipe Cutting Machine manufacturers in India since more than two decades for the industrial use with best of price and quality. We manufacture best quality of pipe cutting machine in India for which we use best quality steel and make our machine more energy efficient, more sustainable, better functionality in the even harsh environment. The chains which are used here for the movement is not specially designed, existing chain can be used which fit into the size. To make the machine with the better result, choose the chain which is of proper size and roll over. Tighten the nut over the chain at the desired site. The torch is to adjust at the cutting site and flame is produced. The knob will adjust the height and by toggle pushing forward start cutting the pipe. The machine starts indexing round on the pipe diameter and cutting of pipe initiated. As the machine starts rotating around the pipe the torch start cutting the pipe with the help of gas. The bevelling can be done with this machine also for which we have to select a particular angle. We supply fixed chains length for the standard size of pipe which can be varied with the diameter of the pipe. This machine does the automatic highly precise cutting of the pipe. It is portable light in weight yet it is robust in design and working. It runs on 220/110 AC current with single phase. It can cut pipe of up to 100 mm thickness. This machine is electrically hand held remote controlled for its activities. The cutting can be done in clockwise and anti-clockwise in both the direction as per the requirement. This is oxyfuel pipe cutting machine with motors and strong gear system. The machine is very handy low in weight and cut the pipe with efficiency.